1Department of Microbiology, K.C. College, Mumbai, India. 2T.N.M.C & B.Y.L. Nair Charitable Hospital, Mumbai, India. The present study evaluates the synergistic association between Cefotaxime and aqueous garlic (Allium sativum) extract (AGE) on extended spectrum beta-lactamase (ESBL) and Ambler Class C (AmpC) co-producing Escherichia coli strains from skin and soft tissue infections (SSTIs). Ceftazidime-resistant E. coli strains were screened for beta-lactamase production by phenotypic confirmatory disc diffusion test (PCDDT) and E-test. Antibacterial activity of AGE was examined by the disc diffusion method and the minimum inhibitory concentration (MIC) of Cefotaxime and AGE was determined. The synergistic association between Cefotaxime and AGE was evaluated by calculating the fractional inhibitory concentration (FIC) index, time-kill kinetics assay (TKA), and scanning electron microscopy (SEM). The zone of inhibition by AGE against the 27 E. coli co-producers of ESBL and AmpC ranged from 17 to 30 mm. The average MIC of Cefotaxime and AGE was found to be 570 μg/ml and 0.86% (4.28 mg/ml), respectively. The FIC index obtained by the checkerboard method established a synergistic association between Cefotaxime and AGE in 10 (37%) test strains, which was confirmed by TKA. The SEM analysis revealed complete cell degradation at 8 hours on the treatment with Cefotaxime-AGE combination. It can be stated that the AGE may aid Cefotaxime in the treatment of beta-lactamase producing E. coli strains from SSTIs. Beta-lactamase, Cefotaxime, aqueous garlic extract, synergy, time-kill kinetics assay, SEM. Citation: Shah PJ, Williamson MT. Evaluation of synergism between Cefotaxime and Allium sativum against Extended-spectrum beta-lactamase and Ambler class C co-producers. J Appl Pharm Sci, 2019; 9(03):098–104. Afroz Z, Metri B, Jyothi P. Bacteriological profile and antimicrobial susceptibility pattern of skin and soft tissue infections among Gram negative Bacilli in a Tertiary Care Hospital of South India. J Pharm Sci Res, 2015; 7(7):397–400. Badar VA, Navale SB. Study of prescribing pattern of antimicrobial agents in medicine intensive care unit of a teaching hospital in central India. J Assoc Physicians India, 2012; 60:20–3. Chowdhury A, Ahsan M, Islam S, Ahmed Z. Efficacy of aqueous extract of garlic and allicin in experimental shigellosis in rabbits. Ind J Med Res, 1991; 93:33–6. Clinical and Laboratory Standards Institute. Performance standards for antimicrobial disc susceptibility tests: approved standard-11th ed. CLSI document M02-A11. CLSI, Wayne, PA, 2012. Colle JG, Miles RS, Watt B. Test for the identification of bacteria. In: Collee JG, Faser AG, Marmion BP, Simmons A (eds.). Mackie and McCartney. Practical medical microbiology. 14th edition, Churchill Livingstone, London, UK, pp 131–45, 1996. Diaz-Visurraga J, Cardenas G, García A. Morphological changes induced in bacteria as evaluated by electron microscopy. Formatex, 2010; 1:307–10. Eja M, Asikong B, Abriba C, Arikpo G, Anwan E. Enyi-Idoh K. A comparative assessment of the antimicrobial effects of garlic (Allium sativum) and antibiotics on diarrhoeagenic organisms. Southeast Asian J Trop Med Public Health, 2007; 38:343–8. Guoliang L, Xudong M, Lisha D, Xixi Z, Yuejiao Wei, Zhongyang Gao, et al. Fresh garlic extract enhances the antimicrobial activities of antibiotics on resistant strains in vitro. Jundishapur J Microbiol, 2015; 8(5):1–6. Miyasaki Y, Nichols WS, Morgan MA, Kwan JA, Van Benschoten MM, Kittell PE, Hardy WD. Screening of herbal extracts against multi-drug resistant Acinetobacter baumannii. Phytother Res, 2010; 24(8):1202–6. Modi K, Bhat A, Joshi P. Plasmid profiling of multidrug resistant strains of E. coli, Klebsiella and Pseudomonas and antimicrobial potential of Allium sativum L. (garlic) against these strains. Int J Curr Microbiol App Sci, 2015; 2:163–71. Mohanty S, Gaind R, Ranjan R, Deb M. Use of the cefepime-clavulanate ESBL Etest for detection of extended-spectrum beta-lactamases in AmpC co-producing bacteria. J Infect Dev Ctries, 2009; 4:24–9. Patel A, Patel K, Shah S, Dileep P. Time trends in the epidemiology of microbial infections at a tertiary care center in west India over last 5 years. J Assoc Physicians India, 2010; 58:37–40. Shah P, Williamson M. Antibacterial and synergistic activity of Calendula officinalis methanolic petal extract on Klebsiella pneumoniae co-producing ESBL and AmpC beta-lactamase. Int J Curr Microbiol App Sci, 2015; 4(4):107–17. Shayan S, Bokaeian M, Shahraki S, Saeidi, S. Prevalence of AmpC and ESBL producing E. coli and antibacterial effect of Allium sativum on clinical strains collected from Zahedan Hospitals. Zahedan J Res Med Sci, 2014; 16(4):6–10. Shinde S, Nataraj G, Mehta P. Multiple beta lactamase resistance mechanism in Escherichia coli and Klebsiella pneumoniae. Bombay Hosp J, 2013; 55(1):32–9. Tariq M, Gore M, Aruna K. Antibacterial and synergistic activity of ethanolic Ajwain (Trachyspermum Ammi) extract on ESBL and MBL producing uropathogens. Int J Pharm Pharm Sci, 2014; 6(6):278–84. Wolde T, Kuma H, Trueha K, Yabeker A. Anti-bacterial activity of garlic extract against human pathogenic bacteria. J Pharmacovigil, 2018; 6(1):253. Cefotaxime—a beta-lactam antibiotic is the most preferable antibiotic given during severe infections (Badar and Navale, 2012). Resistance toward beta-lactams in clinical strains is primarily caused due to the hydrolysis of the antibiotic by a beta-lactamase enzyme. Extended-spectrum beta-lactamases (ESBLs) are enzymes susceptible to clavulanate and they hydrolyze penicillins, extended-spectrum cephalosporins, and monobactams (Thomson, 2010). Ambler Class C (AmpC) class beta-lactamases are cephalosporinases which are poorly inhibited by clavulanic acid, and can hydrolyze cephamycins as well as other extended-spectrum cephalosporins (Sasirekha and Shivakumar, 2011). When ESBL and AmpC beta-lactamase co-exist, they mask each other; hence, their detection is difficult. They also cause an increase in the minimum inhibitory concentration (MIC) values for beta-lactam antibiotics (Sundin, 2009). Skin and soft tissue infections (SSTIs), which lead to hospitalization, are generally caused due to Gram-negative pathogens, which can lead to sepsis, organ failure, and death (Shah and Williamson, 2018). Escherichia coli is one of the most common Gram-negative bacilli likely to be encountered in SSTIs from India (Patel et al., 2010). Due to the increase in the severity of Gram-negative infections, new antimicrobials are being analyzed in the form of natural compounds either as stand-alone or adjunctive therapy (Miyasaki et al., 2010). Garlic (Allium sativum) exhibits a broad spectrum of antibacterial activity against pathogens (Chowdhury et al., 1991; Wolde et al., 2018). Its antibacterial activity is attributed to sulfur-containing compounds like alliin, allicin, ajoene, allyl propyl, diallyl trisulfide, s-allyl cysteine, and S-allylmercaptocysteine (Borlinghaus, 2014). Allicin interacts with important thiol-containing enzymes which maintain the correct redox state within microorganisms, and thus its viability. Hence, developing a resistance to garlic would require modifying these vital enzymes, which would damage the microbes, making garlic a potent antimicrobial agent (Ankri and Mirelman, 1999). There is no documented report analyzing the association between Cefotaxime and aqueous garlic extract (AGE), against E. coli strains which co-produce ESBL and AmpC, from SSTIs, to the best of our knowledge. Hence, the current study aims to examine the synergistic activity of Cefotaxime and aqueous garlic extract on beta-lactamase producing E. coli strains isolated from SSTIs. The present study was carried out in a tertiary care hospital and was permitted by the local ethics committee of the institution (Reference no—PG/EC/40/2012). A total of 59 non-duplicate E. coli strains from SSTIs of patients from our Tertiary Care Hospital were selected for the current study. The samples were cultured on MacConkey’s agar, and E. coli strains identified by conventional tests like cultural characteristics and biochemical tests were selected (Colle et al., 1996). The antimicrobial susceptibility of the E. coli strains was determined by Kirby–Bauer disc diffusion method in accordance with the Clinical and Laboratory Standards Institute (CLSI) guidelines by using commercially available antimicrobial discs (HiMedia, Mumbai, India) (CLSI, 2012). The following antibiotics were used: Ampicillin (10 μg), Amikacin (10 μg), Ciprofloxacin (5 μg), Gentamicin (10 μg), Amoxyclav (30 μg), Ceftazidime (30 μg), Cefoxitin (30 μg), Imipenem (10 μg), and Piperacillin-Tazobactam (100/10). All the strains, which were found to be resistant to Ceftazidime as per the CLSI susceptible breakpoints, were further analyzed for beta-lactamase production by the confirmatory tests. The phenotypic disc diffusion test for ESBL detection was performed as per CLSI guidelines. The current CLSI guideline does not illustrate any method for detection of strains producing AmpC beta-lactamases. Hence, Cefoxitin (CX 30μg)—Cefoxitin/Cloxacillin (30/200) antibiotic discs were used for AmpC recognition (CLSI, 2012; Shah and Williamson, 2015; Tan et al., 2009). ESBL and AmpC detection Ezy MICTM strip (EM081, HiMedia, Mumbai, India) along with pure ESBL detection strips (EM079 Hi-Media, Mumbai, India) were used in the study. The strains were confirmed as ESBL and AmpC beta-lactamase co-producer in reference with the application sheet provided by the manufacturer (CLSI, 2012; Shah et al., 2016). The confirmed ESBL and AmpC co-producers were considered as the test strains in the study. Fresh garlic bulbs (A. sativum) were purchased from the local market and its aqueous extract was prepared by the method described by Shah et al. (2016). To estimate the dry weight of the extract, method of Eja et al. (2007) was performed and the concentration was determined to be 500 mg/ml. The high-performance liquid chromatography of AGE was performed at Natural Remedies, Bangalore, India to determine the percentage of allicin in the sample. Stainless steel column packed with silanized octadecylsilyl silica gel was used in the analysis. The mobile phase was prepared by mixing 40 volumes of a 1% v/v solution of anhydrous formic acid and 60 volumes of methanol. Detection was performed at a wavelength of 254 nm by injecting 10 μl of the sample. The antibacterial activity of AGE was evaluated by the disc diffusion method using Mueller–Hinton agar as described by the CLSI. Sterile paper discs (6 mm, HiMedia, Mumbai, India) were impregnated with 20 μl of the 500 mg/ml AGE and placed on the agar inoculated with the test strains. Imipenem disc (10 μg) was used as positive control, and a disc impregnated with Dimethyl sulfoxide (DMSO) as a negative control (CLSI, 2012). The MIC of AGE and Cefotaxime was evaluated by the agar dilution method. To determine MIC of AGE, dilutions were prepared by mixing AGE with molten sterile Mueller–Hinton agar to get final concentrations ranging between 0.25% and 4% (1.25–20 mg/ml). MIC of Cefotaxime was determined by mixing Cefotaxime with molten sterile Mueller–Hinton agar to get final concentrations ranging from 25 to 2000 μg/ml. A plate of Mueller–Hinton agar containing DMSO served as a control (Nakamura, 2000). where FIC A = MIC of AGE in combination/ MIC OF AGE alone. A minimum FIC index of ≤0.5 indicates synergy, while a FIC index > 2 indicated antagonism. If the minimum FIC index was found to be >0.5 and ≤1, the effect of the combination was termed as an additive interaction. If the minimum FIC index was >1 and ≤2, the effect of the combination was recorded as indifference (Nakamura, 2000; Shah et al., 2016). 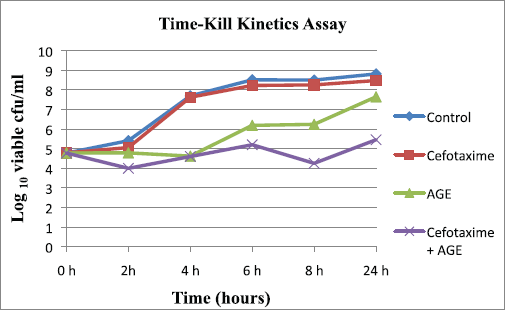 Time-kill kinetics assay validated synergy using the E. coli strain showing the lowest FIC index, by the broth microdilution technique. The AGE and Cefotaxime were incorporated into 50 ml of Mueller–Hinton broth (MHB) at sub-MIC values of 0.25% (1/4× MIC) and 100μg/ml (1/15× MIC), respectively. Tests consisting of MHB incorporated with AGE and Cefotaxime alone, at the test concentrations and control lacking them, were also included in the experiment. A standardized inoculum was added to test and control flasks to obtain a final density of 105 CFU/ml. Bacterial growth was quantitated after 0, 2, 4, 6, 8, and 24 hours incubation at 37°C by plating 10-fold dilutions. Bactericidal activity was termed as a ≥3-log10 reduction in bacterial count in comparison with initial inoculum at zero time. The synergy of the antimicrobial combination was defined as a ≥2-log10 CFU/ml decrease in the viable count, as compared with the use of a single agent in 24 hours. The interactions were classified as indifference when they exhibited a <2-log10 increase or decrease in colony count and as antagonism when they exhibited a ≥2-log10 increase in colony count, after 24 hours incubation with the Cefotaxime—AGE combination in comparison with the most active single agent alone (Pankey et al. 2014; Peck et al. 2012; Tariq et al., 2014). The above E. coli strain, showing the lowest FIC index, was selected for SEM analysis. The analysis was carried out at IIT, Powai, Mumbai. The strain was treated with the same sub-MIC values of Cefotaxime and AGE, selected in TKA for various time intervals of 0, 4, and 8 hours. The treated samples were centrifuged at 1,500 rpm for 2 minutes. The samples were washed using Milli Q water and centrifuged again. Obtained aliquots were diluted 10-fold. 0.01 μl of the diluted sample was drop cast on cover slip and dried. Then, it was coated with silver for conductance and placed on the stobe (sample holder) for morphology examination by SEM (Diaz-Visurraga et al., 2010). In the developing countries like India, SSTIs associated with E. coli are marginally addressed (Ranjan et al., 2017). Analysis of clinical strains for antibiotic resistance is significant for epidemiological and clinical purposes. The E. coli strains from SSTIs showed the highest rate of resistance against Ampicillin, 89.8% (53/59). All the E. coli strains were susceptible to carbapenems—Imipenem and Meropenem. The lowest rate of resistance was exhibited against Amikacin (11.9%). Amongst all the strains, 78% (46/59) strains were resistant to Ceftazidime and 55.9% (33/59) to Cefoxitin (Table 1). Thus, in the current study, carbapenems were the most effective group of antibiotic followed by Amikacin, for the E. coli strains. The resistant rate in E. coli strains toward Ceftazidime was in accordance with the previous study carried out by Afroz et al. (2015). PCDDT and E-test confirmed that 45.8% (27/59) strains were co-producers of ESBL and AmpC, i.e., they were multiple beta-lactamase producers, and were used as test strains in further study. All co-producers of ESBL and AmpC were also detected as multidrug-resistant, i.e., they were resistant to three or more than three groups of antibiotics. Incidences of co-expression of beta-lactamases lead to erroneous treatment choices (Pai et al., 2004). The co-production rate of ESBL and AmpC beta-lactamases in E. coli strains was in comparison to the study carried out by Mohanty et al. (2009). A significant observation of the current study was false susceptibility against Piperacillin-Tazobactam, in-vitro by ESBL and AmpC co-producers. This combination would presumably not be effective under in-vivo conditions for ESBL and AmpC co-producers. Similar false susceptibility was reported by another study carried out in Mumbai by Shinde et al. (2013). To avoid therapeutic failures, it is, therefore, suggested that the detection of AmpC along with ESBL producers should be performed routinely in the hospitals. The increasing rate of resistance toward antibiotics by clinical strains is a serious concern which highlights the importance of developing new strategies to limit the various mechanisms of antibiotic resistance. Previous studies have shown that a wide range of microorganisms were sensitive to crushed garlic (A. sativum) preparations, thus enhancing the interest for garlic as a medicinal magic potion (Ankri and Mirelman, 1999). The estimation of the active ingredient allicin was carried out by HPLC analysis and was found to be 0.20, expressed as percentage w/w. The antibacterial activity of AGE was evaluated by the disc diffusion method and the average zone of inhibition ranged from 17 to 30 mm with a mean of 23.22 ± 4.09 mm against the test strains. Thus, in this study, all the E. coli strains, which co-produce ESBL and AmpC, were inhibited by AGE and the results were comparable to the analysis of previous studies (Modi et al., 2015; Shayan et al., 2014). Table 1. Rate of antibiotic resistance amongst E. coli strains. The MIC of AGE and Cefotaxime was determined by the Agar dilution method. The MIC of AGE ranged between 0.5% and 2% (2.5–10 mg/ml) with a mean of 1.07% (5.35 ± 2.16 mg/ml) as revealed in Table 2. 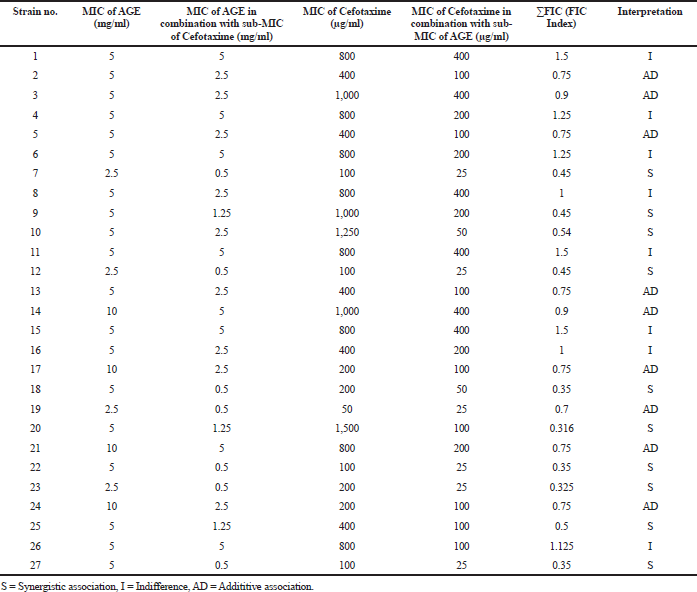 The MIC of Cefotaxime was found in the range of 50–1,500 μg/ml with an average of 570 μg/ml (Table 3). The MIC values estimated were comparable with the study of Shahyan et al. (2014). This signifies the use of garlic in controlling bacterial infections. Cefotaxime was selected to study synergistic interactions with AGE, as it the most preferable antibiotic prescribed during severe infections (Badar and Navale, 2012). Synergy, if demonstrated, is indicative for the successful combination of antimicrobial therapy. If a combination of AGE and Cefotaxime can cause the reversal of the Cefotaxime resistance or lower its dosage in therapy, then this combination could potentially improve the outcome for patients with severe infections. Checkerboard assay was used to determine the combined activity of various concentrations of Cefotaxime and AGE on test strains. Based on the FIC index, 37% (10/27) test strains showed synergism, 33.3% (9/27) strains exhibited additive, and 29.6% (8/27) exhibited indifference effect. None of the strains showed an antagonistic effect between AGE and Cefotaxime (Tables 4 and 5). Thus, the combination of AGE and Cefotaxime showed at least a fourfold reduction in their respective MICs in 37% of the test strains and a twofold reduction in 33.3% of the test strains. The antagonistic effect was not observed in any of the strains, indicative of a positive association between the two antimicrobial agents. The time-kill kinetics assay was performed to confirm the synergistic association with the strain of E. coli having the lowest FIC index. Bactericidal activity was defined as a ≥3-log10 reduction in the bacterial count when compared with initial inoculum at zero time. Bactericidal activity was not observed for AGE or Cefotaxime when used alone at sub-MIC values at the end of 24 hours, in comparison with inoculum at zero time. AGE showed a reduction of 2-log10 CFU/ml, and Cefotaxime did not show any reduction when used alone. The absence of bactericidal activity in the above test may be due to the application of sub-MIC values of AGE (1/4× MIC) and Cefotaxime (1/15× MIC) against the test strain. The sub-MIC values may not be effective in killing the bacteria, but they are capable of modifying their physico-chemical characteristics and the structural design of their surface. It may also interfere with some vital bacterial cell functions such as adhesiveness, surface hydrophobicity, fimbriation, motility, and host-bacteria interactions. The final result of the treatment may be a reduction in bacterial virulence factors (Braga et al., 2000). Table 2. MIC of AGE against E.coli strains co-producing ESBL and AmpC. Synergy of antimicrobial combination was defined as a ≥2-log10 CFU/ml decrease in the viable count, as compared with the use of a single agent in 24 hours. It was observed that when the test strain was exposed to Cefotaxime - AGE combination; in which the concentration of each antibacterial agent was at sub-MIC value, then after 24 hours of incubation, a 3-log10 CFU/ml reduction in the cell count was observed in comparison to Cefotaxime alone and a decrease of 2-log10 CFU/ml in colony count, in comparison to AGE tested alone (Fig. 1). These results indicated a synergistic association between Cefotaxime and AGE against the strain and indicated that the use of garlic was enhancing the bactericidal activity of Cefotaxime. Thus, the present study reaffirms the previous findings that AGE can cause some irreversible damage to the bacterial cells, which may be attributed to a myriad of sulfur compounds present like allicin, which makes it lethal for the cells (Ankri and Mirelman, 1999). 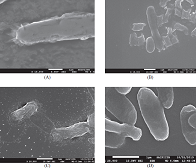 The SEM micrographs demonstrated the differences in appearances of E. coli cells which were untreated and treated with sub-MIC values of antibacterial agents. SEM micrographs revealed the unusual morphological changes in the E. coli cell which co-produced ESBL and AmpC, indicating partial cell damage in 8 hours, on exposure to both the antibacterial agent alone. An uneven cell surface was observed when exposed to Cefotaxime (Fig. 2A) and a slight rupture in the cell wall of the strain was visible when it was treated with AGE alone (Fig. 2B). However, complete cell degradation was observed at 8 hours when the cell was treated with Cefotaxime—AGE combination (Fig. 2C). The surfaces of all untreated cells were intact and smooth (Fig. 2D). The analysis confirmed the synergistic association between Cefotaxime and AGE when the complete cell damage of the E. coli strain was observed at 8 hours, in comparison to a partial cell wall damage that was observed when Cefotaxime or AGE was used alone as an antibacterial agent. The micrographs suggested that AGE and Cefotaxime affected the structure of the cell wall of the E. coli strain. Similar results were observed in a previous study, which reported cell wall lysis for Listeria monocytogenes when exposed to garlic shoot juice. Cell wall degradation has been suggested due to the weakening of the peptidoglycan layer after garlic extract exposure (Kim et al., 2007). In the current study, the micrographs indicated deformed cell shape as well as rupture, lysis, and damage of the cell wall which may be attributed to the combined action of Cefotaxime and antimicrobial compounds present in AGE. Table 3. MIC of Cefotaxime against E.coli strains co-producing ESBL and AmpC. Table 4. Combined effect of Cefotaxime and AGE E.coli strains co-producing ESBL and AmpC by checkerboard method. Table 5. MIC of Cefotaxime and AGE in combination and FIC index against E.coli strains co-producing ESBL and AmpC by checkerboard method. Figure 1. Synergistic effect study of Cefotaxime and AGE on E.coli strain co-producing ESBL and AmpC by Time-kill kinetic assay (n = 3). Figure 2. (A) Effect of Cefotaxime on E. coli co-producing ESBL and AmpC beta-lactamase. The micrograph shows uneven cell wall surface with spikes at the end of 8 hours indicating damage caused by Cefotaxime. (B) Effect of Aqueous Garlic extract on E. coli coproducing ESBL and AmpC beta-lactamase. The micrograph shows a cell wall rupture and uneven cell surface at the end of 8 hours, indicating damage caused by Aqueous Garlic extract. (C) Effect of Cefotaxime—Aqueous Garlic extract combination on E. coli coproducing ESBL and AmpC beta-lactamase. The micrograph shows complete cell degradation at the end of 8 hours, indicating damage caused by combined effect of Cefotaxime and Aqueous Garlic extract, thus confirming Synergism. (D) Control: E. coli co-producing ESBL and AmpC beta-lactamase at 0 hour without Cefotaxime or Aqueous Garlic extract. The micrograph shows intact E. coli cells, indicating no damage and a growing bacterial cell. There is no documented study showing a synergistic effect between Cefotaxime and AGE, against E. coli strains which co-produce ESBL and AmpC, from SSTIs. However, a study by Guoliang et al. (2015) reports a synergistic association between AGE and Cefotaxime against non-beta-lactamase producing Pseudomonas aeruginosa, Candida albicans, and Methicillin-resistant Staphylococcus aureus. Previous study carried out by Shah et al. (2016) also reported synergistic activity between Cefotaxime and AGE against Acinetobacter strains which co-produce ESBL and AmpC. Due to the increased abuse of synthetic antibiotics and the increasing spread of strains with multi-drug resistance, there is a need for an alternative antibacterial agent. The current study is the first to reveal the synergism between Cefotaxime and AGE against E. coli strains co-producing ESBL and AmpC from SSTIs. The synergistic association between the two agents demonstrates the potential application of garlic and antibiotic combinations as a tool for the treatment of infections caused by the drug-resistant bacteria, especially beta-lactams. Further studies are needed to elucidate the molecular mechanisms causing the synergistic effect between Cefotaxime and AGE in vitro. The authors are grateful to the Head of the Microbiology department and the Bacteriology section in charge of Topiwala National Medical College and B.Y.L. Nair Charitable Hospital, Mumbai. The authors are also grateful to Dr. Sejal Doshi from IIT-B, in helping to carry out the SEM analysis. The authors declare that they have no competing interests with whomsoever. Guoliang L, Xudong M, Lisha D, Xixi Z, Yuejiao Wei, Zhongyang Gao, et.al. Fresh garlic extract enhances the antimicrobial activities of antibiotics on resistant strains in vitro. Jundishapur J Microbiol, 2015; 8(5):1–6.